Are you planning on going to SXSW Interactive Festival this year? 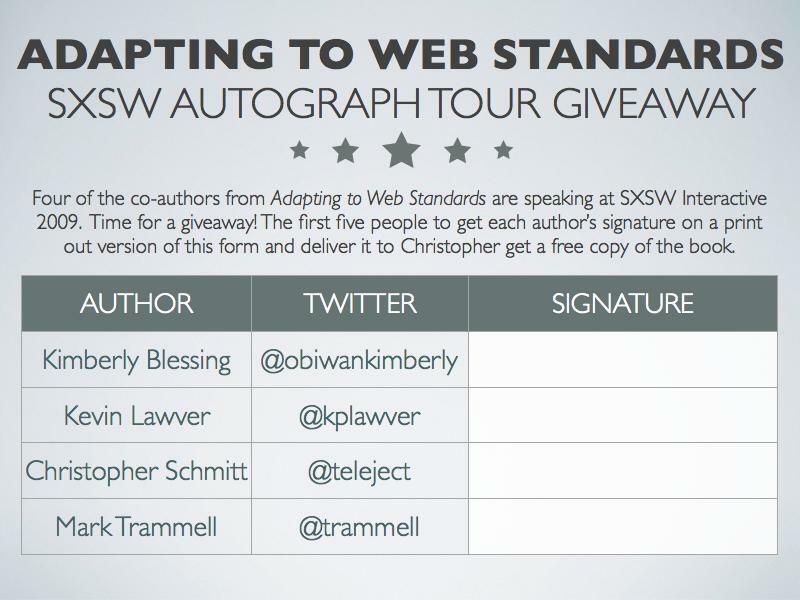 If so, you can take part in the Adapting to Web Standards SXSW Autograph Tour Giveaway. Print out the form below, then track down (politely) all the co-authors and get their signature on the form. Afterwards, give the form to me for a copy of the book. The first five people that do that get the book for free! To that end, we’ve changed up the rules to the contest. You can use your digital camera or mobile’s camera to capture a photo of each of the authors .However, there are some rules to the photo entires! Also, if you happen to be old school and collect all the signatures on paper, you will receive an additional prize To Be Determined Later.